It’s been a few weeks since we last took a look at the continental cyclocross scene beyond the traditional hotbeds of Belgium and The Netherlands. Things are beginning to ramp up with the EKZ Cross Tour having held round two this past weekend in Dielsdorf, the Toi Toi Cup in full swing in the Czech Republic, the Coupe de France preparing for it’s opening weekend in Albi this coming Sunday and some other non-series UCI-rated races happening in Switzerland and elsewhere. Looking over the results sheets for these events, you can see two truths manifest themselves, both of which have been discussed briefly in earlier OTB columns: the European cyclocross season is truly just beginning, so you’ve got riders cherry-picking early season C2s for points in advance of later World Cup rounds, but you also have riders that focus their season on regional or domestic UCI or national series, so they are aiming on banking early season results based off of road or mountain fitness or perhaps off of good training blocks built during the those summer days of everlasting northern European sunlight. Enough of the backstory, let’s get down to the races and look back at the past two weeks of racing and see who’s on the move up the UCI ranking board. Take a big grassy hillside, lots of wind and some rideable planks and logs, et voila, you’ve got yourself a cyclocross course in form of the C2 Radcross Illnau in Switzerland. The men’s elite race was comparatively small, some two dozen riders, but had some big names: Francis Mourey (FDJ), Simon Zahner (EKZ Racing), the Sunweb-Napoleon Games duo of Dieter Vanthourenhout and Angelo De Clercq, Scott-Odlo pro mountain biker Marcel Wildhaber, current French U23 national champion and 2015 FDJ stagiare Fabien Doubey (CC Etupes), as well as former Philadelphia Cyclocross School rider Lukas Müller (Müller Landscaping). After a few laps the grassy power course in Illnau quickly led to a 4-man selection at the front in the form of Mourey, Zahner, Vanthourenhout and Wildhaber. Despite a full-on yard sale early on, Vanthourenhout continued to drive the pace at the front, swapping turns with Wildhaber. By the final lap, it looked to be a 3-up sprint at the finish as Zahner had been somewhat distanced by the trio of Vanthourenhout, Mourey and Wildhaber. However, in the next to last turn Wildhaber tried to make the third-to-first pass on the inside and, rather than making it to the front, succeeded only in taking down himself and Mourey, opening the door for Vanthourenhout to easily take the win. Wildhaber was first to remount and grabbed second, with a disgusted Mourey left to take the last step on the podium. On the women’s side it was a two rider show with Hanka Kupfernagel (Wolfis Bike Shop Heitersheim) and the Italian U-23 Alice Arzuffi simply riding away from the rest of the field. Kupfernagel finally shook Arzuffi on the last lap to cruise across the line for a fine solo win. At this juncture, the veteran German looks to be on fine form to make a run at another successful World Cup campaign. For those that weren’t in Switzerland over the last weekend of September looking for UCI points, some made their way further east to Slany, Czech Republic for some C1 points at round one of the 2015 Toi Toi Cup. Looking over the start sheet on the men’s side and it was a veritable who’s who of those chasing the top tier of European cyclocross: Jim Aernouts and Jens Vandekinderen (Telenet-Fidea) Radomir Simunek (ERA-Murpotec), Marcel Meisen (Kuota-Lotto), Michael Boros, Wietse Bosmans and David van der Poel (BKCP-Corendon), as well as a host of talented Czech and Slovak riders like the former BKCP-PowerPlus rider Lubomir Petrus (EthicSport Prestige). On a clear and sunny day, with dry conditions prevailing, and course which ran in and around an athletics stadium, the pace of racing was high and large gaps never really formed. Eventually the podium battle came down to a four man group of Meisen, Aernouts, Simunek and Boros, with young Czech talent Tomas Paprstka furiously chasing just behind. On the run in to the line it was Meisen, fresh of a solid summer of Continental-level road racing, who had the better turn of speed and bested Aernouts and Simunek on the day. On the women’s side it was all Pavla Havlikova (MRM-Avalon Pro Cycling) as she simply rode away from a fatigued Hanka Kupfernagel (Wolfis Bike Shop Heitersheim) who had made the 7-hour drive from Illnau overnight in search of more UCI points. Landing the last podium spot on the day was 18-year old Czech junior Jana Czeczinkarova. This past weekend, while many cyclocross fans were focused on round one of the Superprestige in Geiten, or on the KMC Cyclocross Festival in Providence, round two of both the Toi Toi Cup in Hlinsko and EKZ Cross Tour in Dielsdorf were taking place in the background, providing ample opportunities for UCI points and, perhaps more sought after, sizeable prize purses. With only C2 points on offer in Hlinsko, both the men’s and women’s elite fields were smaller and largely composed of Czech and Slovak riders. On the men’s side, it was not just a Czech podium sweep, but a dominating ride by the aforementioned Czech youngster Tomas Paprstka (Remerex Cycling Team Kolin) who soloed in 1:26 over the second placed veteran Lubomir Petrus. Third on the day was 21-year old Czech U23 star Jakub Skala (CEZ Cyklo Team Tabor) who should be a familiar name to European cyclocross fans given his regular top-10s at World Cups and his bronze medal from the 2014 European Championships. The women’s race was again a two horse race early with Havlikova and Czeczinkarova simply riding away from the the rest of the field. Havlikova finally dropped her 18-year old countrywoman and crossed line with plenty of time to celebrate her win and overall lead in the Toi Toi Cup standings. 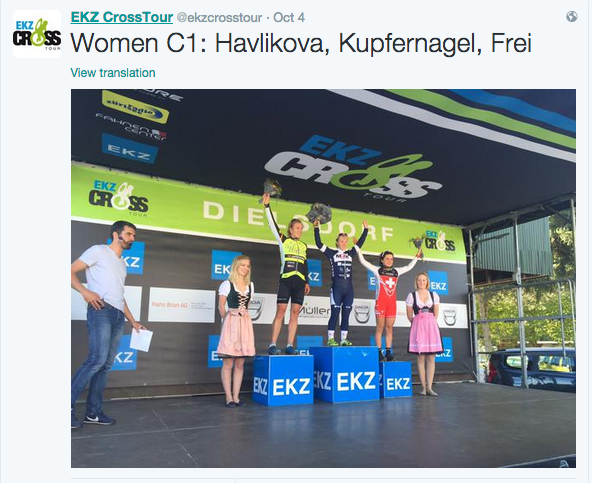 Third on the day, another minute behind Czeczinkarova, was the Austrian U23 Nadja Heigl. Twenty-four hours later, and 825km southwest, the EKZ Cross Tour kicked off round two in Dielsdorf under sunny skies and with an impressive list of stars in attendance on both the men’s and women’s side. As has been mentioned previously, this series continues to grow in stature given it’s deep and generous prize list, professional and safe courses and excellent venues, and the racing on the day did not disappoint. The men’s side saw many familiar names from round one: Clément Venturini (Cofidis), Francis Mourey (FDJ), Steve Chainel (Cross Team by G4), Dieter Vanthourenhout (Sunweb-Napoleon Games), Sascha Weber (Veranclassic-Doltcini), Simon Zahner (EKZ Racing), Marcel Wildhaber (Scott-Odlo MTB Team), Jim Aernouts (Telenet-Fidea) and the Müller Landscaping duo of Lukas Winterberg and Lukas Müller. On a course in Dielsdorf routed through a hippodrome–but far more imaginative and exciting than the old World Cup race in Rome–the dry conditions encouraged fast racing and, appropriately enough, was a test of horsepower more than technical aptitude. 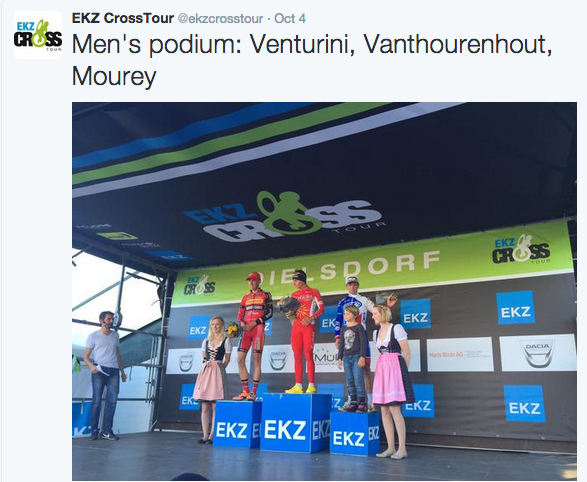 That said, all you needed to know is this: the EKZ Cross Tour is quickly becoming the playground of Clément Venturini. After a bottleneck on the first lap at the top of a flyover, Venturini simply took off and rode out to a comfortable gap. Content to let Vanthourenhout, Mourey and Wildhaber recreate their chasing effort from Illnau the previous weekend–this time with Sascha Weber for company–Venturini simply set his own pace and stamped out the watts. At the end of 62 minutes of racing this all added up to a comfortable 42 second gap over Vanthourenhout who escaped from Mourey to take second, leaving the Fotuneo-Vital Concept-bound Frenchman to the last step on the podium. Beyond Venturini’s dominance, the French had a great day with Mourey in third, Chainel in seventh, Russo in eighth and Doubey in tenth. At this juncture, Venturini has a demanding lead in the EKZ overall standings and it appears his decision to focus his energies there are paying dividends. Over on the women’s side it was Pavla Havlikova’s turn to make the long overnight drive in search of points and money in Dielsdorf. She must have left the driving to someone else, because in the three-way battle between herself, Kupfernagel and 19-year old Swiss mountain bike star Sina Frei (JB Felt Team), the diminutive Havlikova prevailed. In the battle for second Kupfernagel edged out Frei, who looks to be continuing her run of podiums across all disciplines this year. In a continuation of the trend from the men’s race, the French had a great day with 8 riders in the top 13, with Lucie Chainel-Lefevre (Cross Team by G4) taking home a notable 9th place. That’s it for OTB this time around. 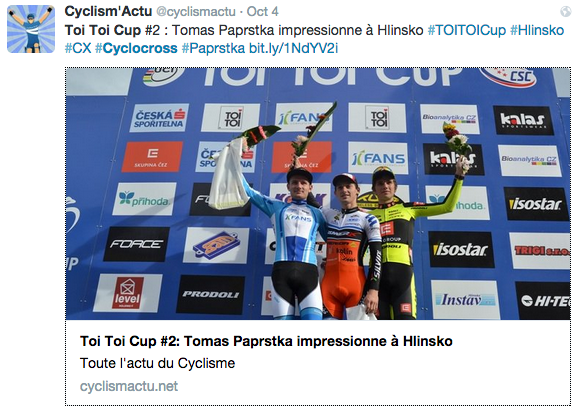 In a few weeks we’ll have more Toi Toi Cup action to discuss, a recap of the Coupe de France and British National Trophy Series opening rounds, some non-series UCI events in Slovakia and elsewhere, as well as a rundown on the Estonian and Canadian national championships. It’s my hope that more folks learn about, and watch, the great cyclocross that is happening in places like the Czech Republic, and being able to watch the races online helps! I hope you’re enjoying the column and please, comments and suggestions are always welcome.